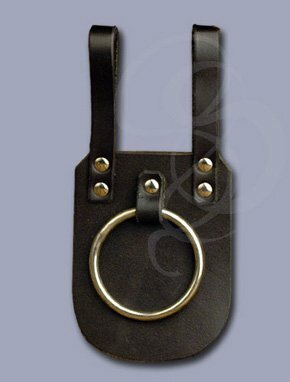 This type of ring mount has been a time-tested method for carrying swords, daggers, axes, maces, hammers, dead chickens, microphones, and much much more. 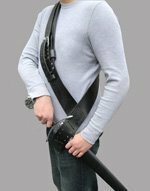 Slides easily onto your belt and the instrument in question slides into the ring (not that I'm calling your sword into question, mind you. Unless you didn't buy it from Strongblade, in which case, I am calling it into question). This is the large version of the ring mount (you can check out our Small Ring Mount here). 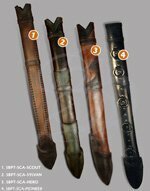 It accepts most blades or shafts narrower/thinner than 2.5 inches. By the way, narrower, when speaking about a sword blade, means the dimension from edge to edge, not the thickness of the metal. Swords in this type of mount usually must be worn without a scabbard, so if you want to wear a sword with a scabbard, you should probably check out one of our other Sword Frogs.